And all the men and women merely crew. Some observers would think this film shoot was completely under control. The set is perfect: pageant stage with balloons and sparkly ribbons, awards table with assorted trophies and crowns, an oversized check. In the ballroom next door, a makeup artist is stationed at her battalion of paints, powders, mascara wands, curling irons, straightening irons, brushes, hairpins. 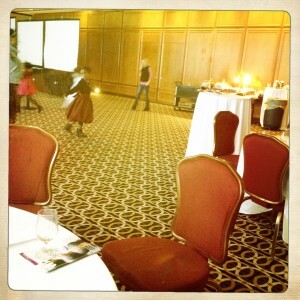 At another table, little girls’ dresses are laid out, very pretty. A script lies on the next table, my part highlighted in bright orange. I’m sitting at the table, but I’m not working on my lines. My co-star has never seen the script. She’s never seen a script. She’s seven years old. “I thought this was a play,” she says, which explains why she kept asking where the audience was when the director took us on set a minute ago. I thought she meant the fake audience, the parents and kids who normally would be in the audience, watching the girls dance and pose onstage. The director explained that they’d be shooting her scene from the audience’s point of view so we really didn’t need more than two or three people in the seats. But now, sitting with her at the table, in the early months of this year of a day when I still think the lines matter, it’s hard to know exactly what she meant. She sounds out the words of my dialog, maybe because they’re glowing with orange. “That’s a spelling word,” she says, pointing to the word know. I hate to tell her that’s one of my lines, because it’s taken so long just to get to the point of sitting here, which is what I think we need to be doing. Actors review their lines together, right? You run the stuff you’re going to shoot that day, and build some kind of rapport, especially if you’re going to be playing mother and daughter. I’ve already warned her that I’ll be saying some mean things because the mommy in the story is a little crazy. “No way you can make me cry,” she informed me when we met. “No, you can’t do it,” she laughed, and I thought we were off to a good start. “No, we don’t have to read that part,” I say. “Can I have this dress?” She’s wearing an adorable black and white dress she calls her Lady Gaga. It’s trimmed with faux fur. “I know how to dance. I’m good at dancing. Want to see?” She starts dancing, and I get up. I decide I don’t need to worry about the script. “He’s my daddy?” She raises her eyebrows again. So maybe it’s not my color that she’s questioning, it’s just the possibility that anyone other than her dad could be her dad. “It’s his story, that’s why we’re doing these things,” I say. MT, please keep reporting about the shooting. It’s fascinating.